Communication skills in the workplace is the lifeline of the organization. Work cannot be carried out efficiently if there are communication barriers between the employees. 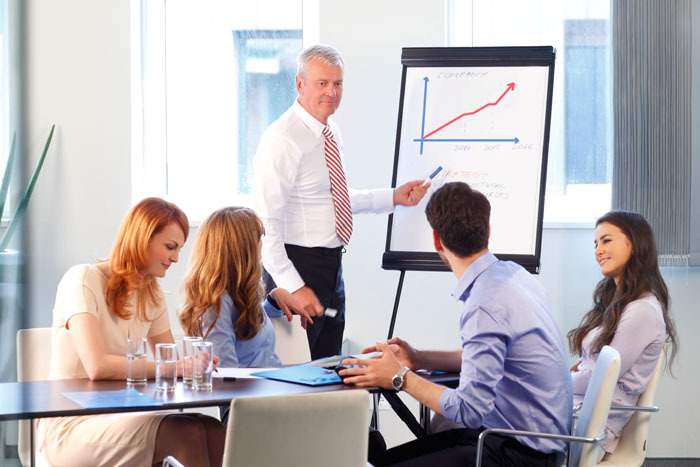 The manager is an integral part of the organization. Not only does he manage the work but is also responsible for the organization as a whole. He serves as the nodal point between the employees and the seniors in higher positions. He also manages the levels of relationships among the employees and solves differences when they arise. As a manager, the responsibility of running the organization falls on him. The key to running the firm efficiently is good communication skills. He has to get his message across to the employees in a clear and distinct manner such that everybody can understand him. He also has to manage the quality of communication among the employees themselves because messages can get lost while being communicated over and over again. Mary is the manager in the head office of a company. She has recently been promoted to the position. Being a professional, she wishes to bring about some changes in the workplace such that it would bring about better coordination and efficiency. Hence, two weeks into her new position as a manager, she brings about various changes in the office. She held a few meetings with the staff to review and articulate their opinions. She believed that what she got was mostly positive responses to the changes that she proposed. So, she went ahead with the changes. However, a few days later, she saw that the employees were not showing any improvement in their levels of efficiency and coordination. Instead, there was confusion about the new procedures and people did not know whom to consult about the new changes. This lead to confusion, which affected the company as a whole, as several of their activities and important works were delayed. Mary fell short of efficient communication with the staff in the office. Even though her intentions of bringing about change were good but they were ill-thought off and she did not consider the opinions of the staff seriously. What she failed to understand is that despite having meetings to convey her aims, people are not usually willing to speak out in front of an audience about their opinions and thoughts. What Mary perceived as ‘good response’ was reluctance and a neutral response at the best. Also, she clearly did not bother to explain the new changes properly to the staff, who, as a result, were unaware of the changes. They were unable to work out the new structure and wasted time trying to learn and understand them. Such structural changes are supposed to be implemented slowly and in several phases. Mary made the mistake of imposing them all together and in a haste, which makes it counterproductive as people need time to understand and adjust to the changes. Thus, even the employees could not communicate efficiently amongst themselves as they did not know what was going on nor could they explain it to others. It would have been better if Mary consulted the staff in a more comprehensive manner than just a few meetings. Consulting in separate, small groups helps in understanding the opinions in a more efficient way. An anonymous survey via a questionnaire would bring more fruition as people tend to express themselves more freely when their identities are not disclosed. A good way to understand the difference between positive and neutral response would be to structure questions in a such a manner that directly reflects the candidate’s response. Thus, instead of asking ‘what do you like about the new changes?’, if it is framed as ‘Do you like the new changes?’, it will give a clearer picture of the general attitude. Since changes need time to be adapted to, Mary should conduct a few workshops which would introduce the changes to the staff. Pamphlets and newsletter should be distributed regularly to update the employees about the changes and the progress made because of them. The changes should also be implemented in various phases at regular intervals such that they can be absorbed efficiently. Thus, the manager’s communication skills need to be in sync with the rest of the people in the organization. What is important to remember is that not everyone in the office may have similar opinions. The manager must consider what he wants the other person to hear. It is also important to keep the type of audience in mind and how to approach them.